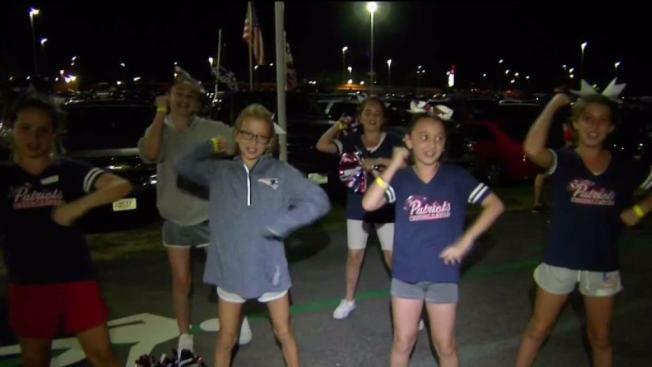 Even though it ended in a loss to the Jaguars, Patriots fans were excited to be at Gillette Stadium to cheer on their team in their first game since their thrilling Super Bowl victory. Chad Henne hit Keelan Cole on a 97-yard touchdown pass, Corey Grant scored on a 79-yard run and the Jacksonville Jaguars feasted on a Patriots lineup without Tom Brady and Rob Gronkowski — or much defense at all — to beat the defending NFL champions 31-24 on Thursday night in their exhibition opener. With the reigning Super Bowl MVP sitting out, Jimmy Garoppolo completed a Brady-like 22 of 28 passes for 235 yards and two touchdowns. The Patriots' heir apparent completed 13 straight passes at one point, finding Austin Carr on a 3-yard touchdown pass at the end of the first half and then K.J. Maye from 5 yards out to start the second and make it 17-17. Do the Patriots Have the Best Cornerback Duo in the NFL? But the New England defense followed by giving up another one-play scoring drive — this one Grant's run down the left sideline to make it 24-17. Third-string QB Brandon Allen hit Dede Westbrook from 42 yards out — victimizing Patriots cornerback Cyrus Jones for another big play — to make it a two-touchdown game. Grant ran for 120 yards on eight carries, and No. 4 overall draft pick Leonard Fournette ran nine times for 31 yards and a 1-yard touchdown for the Jaguars, who were playing their first game under new coach Doug Marrone after firing Gus Bradley following a 3-13 record. Executive vice president of football operations Tom Coughlin, the former New York Giants coach who twice beat the Patriots in the Super Bowl, watched from the press level. Patriots: DL Deatrich Wise left with a head injury in the first half. NFL Commissioner Roger Goodell attended the game — his first visit to Gillette Stadium since suspending Brady for four games in the scandal that came to be known as "Deflategate." Widely resented by New England fans, Goodell was spotted in Patriots owner Robert Kraft's luxury box at the start of the game. After struggling in 2016 on special teams, the Jaguars hired Joe DeCamillis and brought in several specialists. Rashad Greene Sr. had a 41-yard punt return.